“Watkins, the county seat of Schuyler county, situated at the head of Seneca Lake and named in honor of Doctor Samuel Watkins, a prominent land owner, and an early resident, and distinguished citizen, is one of the most pleasant and delightful villages in the state. The elegant private residences, the public buildings, its hotels, and the romantic scenery of its glen, and the inviting waters of the lake, make it a great resort for the invalid and those who desire rest and recreation. The views obtained from it and the surrounding hillsides cannot be excelled. Its settlement and history dates back to revolutionary days, and Indian legends are connected with its occupation by the warriors of the Six Nations. According to early 19th century physicians, it was topography that defined the flow of miasma and weather that helped define these patterns. This was the most single important feature a new settler had to know about of any region he or she planned to settle. Whether or not a farmer could build a homestead and then follow it up with a successful farm and livestock business was dependent not only upon physical geography features like soil and weather, but also upon the ability of family members and farmhands to work, to assist in the planting and growing of crops, and to have the energy and stamina needed to raise livestock in such a wilderness setting. The ability to survive in the wilderness setting was just the first requirement for setting previously unsettled lands. To become economically self-sufficient, one had to at least be able to open a family run market and/or supply the local store with ample supplies of fruits and vegetables, milk, butter, eggs and poultry goods, and depending upon the time of the year, plenty of salted pork, barrels filled with preserved beef goods, and enough burlap bags filled with root crops like turnips, potatoes, onions, and celery root to last an entire winter. When the western parts of New York were opened up for settlement, the health of the land depended very much upon the health of the people, and the health of the people in turn depended upon not only the climate and various natural features of a new environment that might potentially make them sick, but also be able to protect themselves from these pathogenic environmental features. They accomplished this by avoiding the miasma, staying clear of places with known endemic patterns persisting locally, and investing in clothing, living patterns and foodways required to keep all potential farm hands and owners in the best of health. At the southern end of the finger lakes, there were some settings that were pristine, bearing crisp, clear water and plenty of woodlands. There were also a number of lake edge settings and areas along the small creeks that flowed into these lakes that were accompanied by marshy, swampy grasslands and vine-ridden, thorny shrub settings. These exceptionally long lake settings had hundreds of miles of shoreline, along which fevers could erupt. Throughout this entire region, regardless of proximity to the lakes, certain endemic diseases remained common such as the goiter and other diseases signs that we know today to be due to poor nutrition. In 1790, there was this roadway or path laid that led travelers into this Iroquois village. From there, many continued their travels northward by travelling along either side of the lake. The eastern side of the lake was apparently more popular, with a hillside geography in its favor when it came to long, tedious summer excursions through what might other wise be a totally exposed countryside. The fact that the hill on the eastern side of the lake were often covered by trees made it shady. The west side of the lake was completely exposed to the hottest suns during the summer months, with a treeless nature that made it more susceptible to exposure to the seasonal northern winds. Either of these two northward routes brought travelers high enough above the lake’s surface to see how far this curious water form made its way north. Even on a clear day, no end of the lake could be seen. For many early wilderness and hinterlands travelers, it was probably hard to believe that this route was not along the largest lakes in the region. To the far north there were several even larger lakes, so large in fact many of these fresh water bodies inherited some of the best and the worst of the great Atlantic oceanside features in spite of the distances between these two settings. The shores of the Great Lakes, like the east coast ocean shores, bore yellow fever. Its shipping routes were so heavily travelled that due to the garbage, refuge and waste left behind by travellers, some sections were considered very unhealthy due to the poisonous effluvium filling the ports and bays, considered the chief cause for local epidemics of ship fever (typhus). The interior of the country was also considered to be the heart of a Small Pox region found on many medical geographer’s maps. The hinterlands setting bore many people not exposure much at all to others. Unlike the towns and cities, the younger generations that grew up in these wilderness settings periodically caught the pox following a visit from still other travellers. The most susceptible people to the pox were always the indigenous families and occasional Christian Indian and missionary wed mixed-breed couples common to this setting. Their children inherited the weaknesses of their Indian parent, and were often the most susceptible to the various forms of the pox, fever, and throat distemper (sore throats, mumps, diphtheria) that would occasionally strike the otherwise very isolated homesteads and hamlets of this region. These Euro-american disease traits characteristic of Euro-america settled regions, early or mid-stage in development, were quite different from the traditional indigenous diseases of the region. Consumption was fairly common in regions where humidity prevailed enough to debilitate anyone working or travelling too much on those uncomfortable days. Also common were the apoplexies (“strokes”) induced by heat and hard labor, the pleurisies brought on by bad air and too much exposure to smoking and sweat lodges, and an occasional affliction brought on by invasion of local animal spirits like the snake, the Great Bear, the manitou, or the Willow-winds blowing in from the lake’s edge, accompanied by windigo or susto. Many of the disease indigenous to the lower Seneca setting had to be understood and recategorized by settlers in order to make better sense of what the “true” medical problem was, and how it was best treated. Some indigenous medicines were already documented by earlier colonial explorers and settlers, but this region did have certain differences that early 19th century writers felt were important to note. Any settlers well-trained in common sense and business would see the European and local Euro-american value to some of the Indian products and some of their uses. Prior to when the first new settlers came into this region, the indigenous people living here had accomplished much in their redesign of the local ecology. Their long houses required a large lumber supply, som at least a few trees were missing from the region. Their fabrics, cordage, baskets, and other products required adequate hemp and fiber stores like the local “Indian Hemp” (Apocynum cannabinum), cattails, and willow. Their food supplies included game animals, wild fowl and fish, Indian corn, squash, legumes, and depending on the season, wild rice. In recent decades, it has come to be realized that not only did white man aggressively change the local environmental setting, so too did the Indians. The changes the Iroquois produced including the forced change of formerly pristine growing field and forest environments. Early explorers noted some forest floors to be edvoid of undergrowth, a possible result of periodic burning in order to movee and capture large numbers of wildlife for their hides, miscellaneous parts and meats. Once this place was resettled by euro-american families and utopian groups, the entire topography was once again changed as these new settlements were developed. The small glen, or narrow streamside setting defining this place also made it so attractive to future settlements would later become the primary reason claims made to this land first by New York government itself, followed by major investors in this land, who in turn were followed by their clients who purchased this land from them. This turn the health salubrious etting of Watkins Glen into a hamlet, then a lake side village, then a retreat for those sick or very ill, each of these phases in its development taking place prior to 1830. 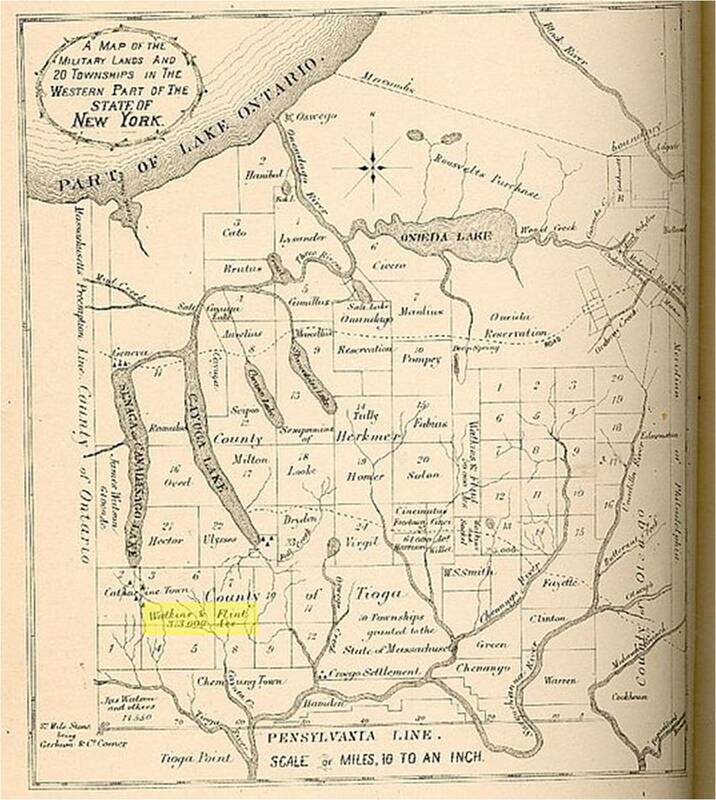 In 1768, a property line was defined for the Iroquois and that part of western New York that they retained claims to. This area was bordered by a line that ran from Fort Stanwix to the head of the Unadilla River. This ownership pretty much went untouched on paper, but hundred of European descended Americans made their way slowly into this unsettled territory. In 1778, General Sullivan removed a small clan of remaining Iroquois in the region under review for this essay. In 1784, a second Treaty of Fort Stanwix was written in which the Iroquois surrendered their land claims for the region west of Buffalo Creek. This was followed by another series of treaties written up and signed by the Six Nations between 1784 and 1790 signing over all lands east of the Genesee River. 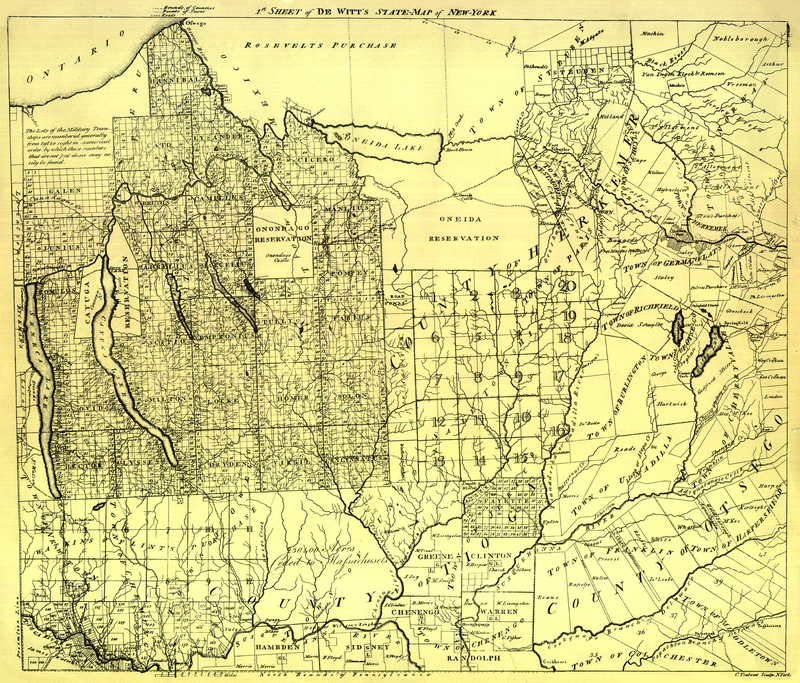 In 1791, Watkins and Flint began their plans for settling parts of western New York. The Watkins and Flint purchase was completed in just a few years followed two smaller purchases by Watkins. Since many of these purchases had their boundaries define by major rivers, those parts originally included in the New York Treaties which extended along the river’s edge into Pennsylvania (much of Pennsylvania was lost with the Stanwix Treaty, see http://pabook.libraries.psu.edu/palitmap/Stanwix.html) had to be turned over to Pennsylvania, which defined its own portions of treaties already signed by the Iroquois. 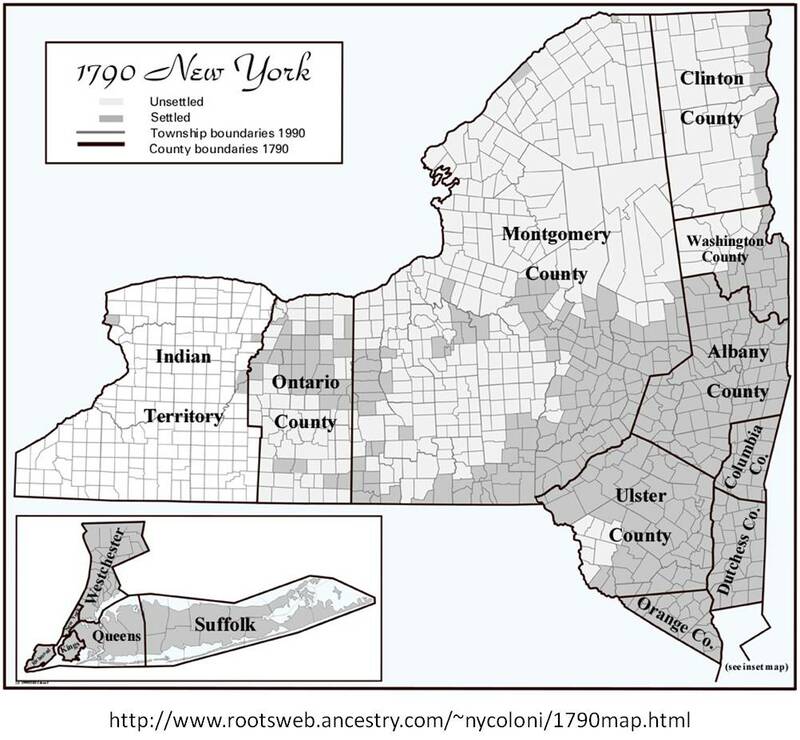 Before the century was over, nearly all of the lands that today define the State of New York were signed over to New York and those malingering parts further south to Pennsylvania. This left the surviving members of Iroquois and other neighboring nations, tribes, clans, and families just a few reservations to move to. It was these initial settlers who would modify and erase much of the original Indian carved topography throughout this region. They replaced this wilderness like setting with their own pastoral setting. 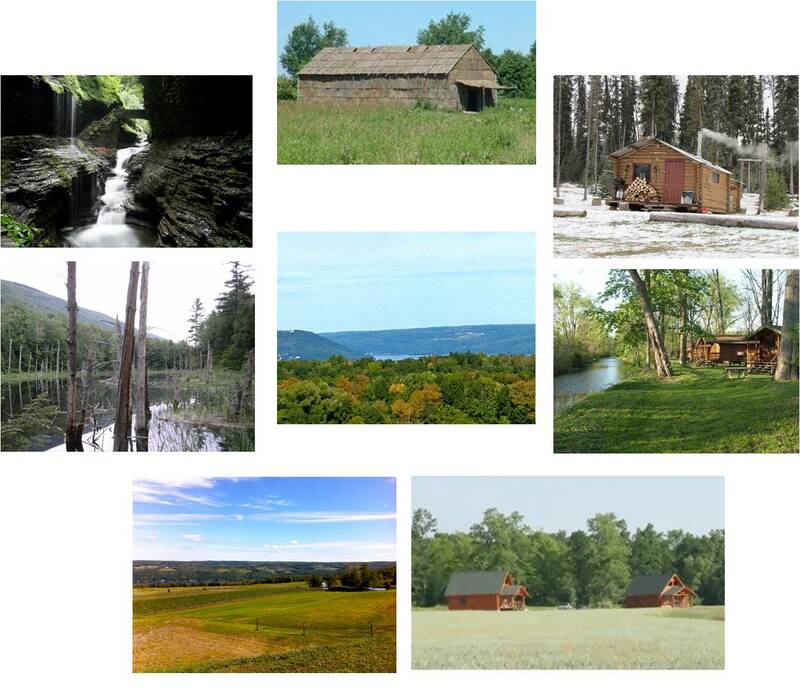 Very quickly the individual homesteads led to the raising of small hamlets followed by villages, with much larger versions of corn fields and gardens being raised in the natural fields being reseeded and whatever forests were leveled for building materials. Alongside the numerous corn and flax fields were the grazing fields necessary to raising livestock. These changes meant that the once abundant acreage of fields complete with thousands of natural flowers and wildlife came to be replaced by orderly rows of fruit- and vegetable-bearers in just a generation or two of development. Where once there were large supplies of plants naturally bearing edible seeds, berries, flowers, and rootstocks for indigenous use, these were now replaced by a just a select few species of vegetables, fruit and livestock needed to serve to pastoral farmland setting laid out by the pioneer families. Salubria or Watkins Glen is in Rush’s Stage 1 and its precedent for much of this period of time reviewed. Several of Watkins articles published in the Medical Repository provide us with insights into his philosophy of disease and health. One of these articles is on how to properly grow crops, another on the mysterious fever erupting from the marshy areas along the shores of the Finger Lakes (an early introduction of yellow fever). Like Chancellor Livingston, John W. Watson was focused on disease as a consequence of our exposure to the environment, with many disease preventible through proper home construction, wearing the right clothing, and engaging in healthy foodways and physical activities. To accomplish this these new settlers removed most of the remaining trees, filled or leveled the numerous wetlands and marshes, dug new canals, culverts and other waterways, and by doing so successfully diverted not only water but also new forms of disease onto their new agricultural domain. Any region where diseases were rarely a part of the local history were now more likely to cause illness and death. Diseases previously never experienced by indigenous people took on a new form, at times extinguishing old cultures as well as the new. By changing the hills and ravines, modifying the soil form and chemistry, reducing one set of flora at the expense of another, replacing the locally abundant wild pea and wild clovers with the more tamed European species of white and red clover, the planting of acres of grain producers, and an occasional vetch vine or two to rejuvenate the soil, a farmer who decided to move to this part of New York could successfully modify his living setting. If properly developed, the belief was that this farmer could eliminate the older diseases that existed in the region by removing the miasma source, in some cases resulting in the evolution of new forms of diseases in this setting and on occasion the development of new endemic diseases to this region such as beri beri, scurvy and goiter. This is the logic that probably ran through the main of many potential settlers of a distant land where the winds were more ferocious due to the lakes situated in all by one direction, and the greatest lakes of all located far to the north, but still close enough to produce frigid and often very snowy winters in the region. This reasoning was used to explain why these settlers removed to western New York, one potential result of this attempted settlement was clear–this was the purest example of natural selection taking place during a time when Erasmus Darwinianism and Lamarckianism were used to define who was to live and who was to die. One moved to this region to get away from diseases that were evolving along the western shoreline communities, such as dysentery and bilious or malignant fever, and ultimately the deadliest of each, like cholera morbus and the black plague or yellow fever. John W. Watkins graduated from Columbia College in New York with a masters degree in the Arts in 1788. These concepts about the environment and health were common professed by many of the most learned people he would have been in contact with during these years. There was some controversy erupting about how valuable the teachers of Columbia College were. They were after all classroom bound for the most part, theoreticians with little practical skills associated with the raising of a countrymen, a sophisticated farmer. Nevertheless, Watkins goal of attending school, to become learned enough to be a lawyer, put him in close association with a number of highly important people in New York and Hudson Valley history. In just two years, he became a close associate of the Livingstons, John Jay, and even Thomas Jefferson. But the most outstanding and most important political leaders he was affiliated received their own honorary degrees alongside Watkins on his graduation date–Alexander Hamilton and Samuel Mitchell. During this same ceremony, Peter S. Livingston received a Bachelor of Arts. About this time, there was a major schism developing in medicine. Two sources for medical education existed–Columbia College and a group of physicians working at the hospital for the City who together considered themselves clinically minded medical teachers. , offering the potential medical apprentice the opportunities to attend their training sessions in the form of lectures and to learn about how medicine was practiced by being granted the rights to walk the floors of the large hospital they re-opened after the revolutionary war. When Watkins began his training at Columbia, this institutional setting was not yet fully reopened. No matter, he was not there to become a doctor, just to learn whatever he could to become a successful attorney, and more importantly, a successful businessman. Following his graduation from Columbia in 1792, he soon married into the Livingston family. This soon after enabled him to follow in the footsteps of one of the more famous members of the Livingston family– Chancellor Robert Livingston. John W.’s long term plan soon became to follow in the Chancellor’s footsteps as an entrepreneur interested in developing new uses and income sources from the new territories being claimed out west. The first important part of this tale about western New York appears in a book on the history of Schuyler, NY, printed around 1885. This book provides the details about how the south end of Seneca Lake was settled prior to the American Revolution. With the onset of the Revolution and the fights that ensued between Iroquois Indians and families residing in the wilderness, General Schuyler was sent to west by General Washington to secure this region from any further threats. As a result, the following happened, as told by the local historians. This quote is from: SCHUYLER CO., NY HISTORY 1854–1885 “HISTORY OF SEVEN COUNTIES presented by the Elmira Weekly Gazette”. “An Outline History of Tioga & Bradford Counties in Pennsylvania; Chemung, Steuben, Tioga, Tompkins and Schuyler in New York by TOWNSHIPS, VILLAGES, BORO’S AND CITIES.” Written expressly for the Gazette Company, Elmira, N. Y. Published 1885., p. 232. Accessed 3-24-2012 at http://www.rootsweb.ancestry.com/~nyschuyl/schuhist.htm. The local history of Schuyler county extends back to the revolutionary war and beyond. General Sullivan in 1779, in his expedition against the six nations, came down the valley of Catharine creek, and on the east side of the Seneca Lake, destroying the orchards and cornfields of the Indians, which he then found, located upon lands now within the limits of Schuyler county. The lands around the beautiful Seneca Lake were the choice hunting grounds of the red man, and the waters of the lake their favorite fishing resorts, and where they had for centuries established their rude huts, planted their corn, and gathered the fruits of their orchards. One of the aged Queens, Catharine Montour, had her home in a village near the present village of Havana. Sullivan’s men found her at her Indian village “Catharinestown”, where she had been left in a helpless condition by the Indians who fled before the invading army of Sullivan. They treated her kindly, and provided for her wants. It was in her honor that the town of Catharine, and the creek was named, and the township of Montour given. The fame of Catharinestown was heralded far and wide, and the fruitful orchards and productive lands upon the borders of Seneca Lake were described by Sullivan’s soldiers, to attentive and listening ears among the heroes of the continental army, which as soon as peace had been declared, and the land open for occupation, came thronging into the lands of the Senecas. 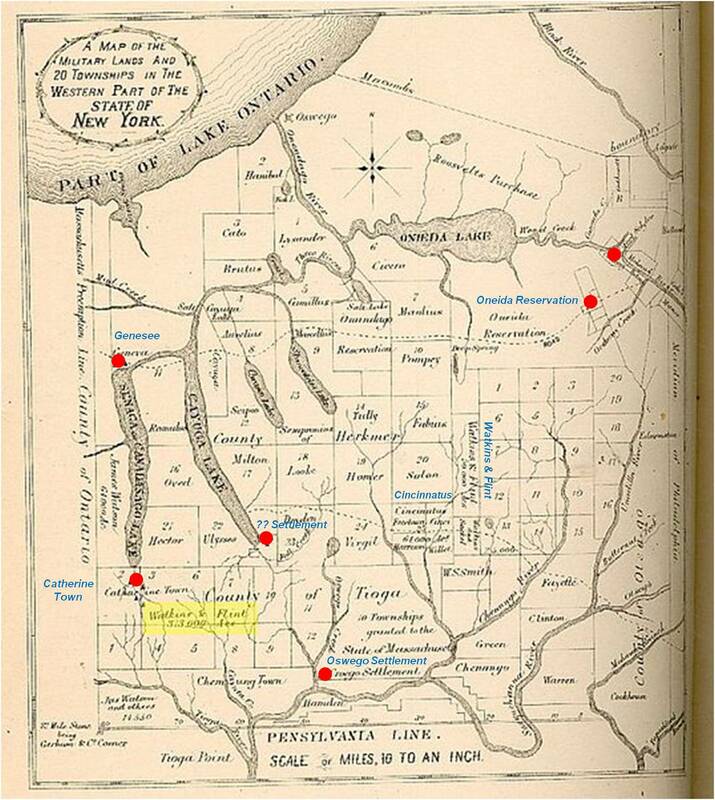 Syndicates existed in those days, and large tracts were secured by capitalists, and notably among these in the present limits of Schuyler county were Royal Flint, Jonathan Lawrence, Robert C. Livingston, John Lamb, M— (maybe Melanathon??) Smith, James Watson, and John Watkins, and known as the Watkins and Flint purchase (see history of Watkins). John W. Watkins became part of the Livingston family when he married Judith Livingston, the daughter of New Jersey Governor William Livingston. Gov. Livingston was the brother of Phillip Livingston, the second son of Phillip Livingston Senior, and the second Lord on the Manor bequeathed to the Livingstons by the King of England in1697. 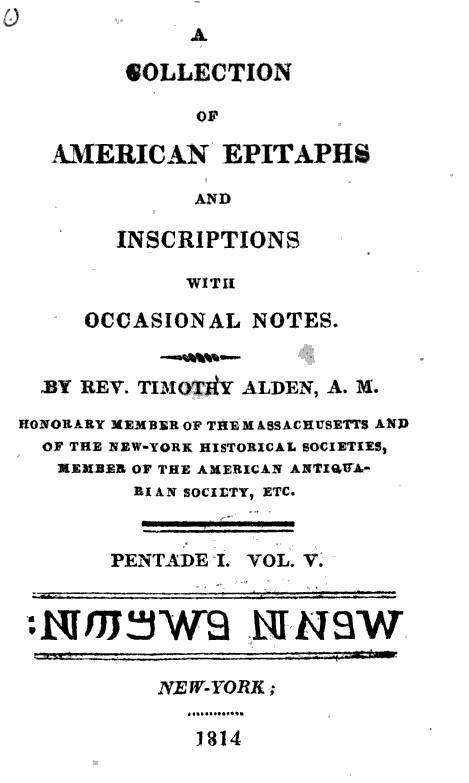 One of the earliest renderings of this piece of American genealogical history appears in a book published in 1814 called A collection of American Epitaphs, by Rev. Timothy Alden. Alden simply reviews the heritage behind the Livingsons, family that played important roles in the Revolution, the purchase of that part of the greater midwest known as the Louisiana Purchase, and the settling of unclaimed portions remaining of western New York just south of the Great Lake, east of Ohio. To many Hudson Valley historians, the names that appear adjacent to the Livingstons and John Watkins are very familiar. A number of these families played important roles in laying claims to New York before the final colonial boundaries were established. The Van Rensselaers were descended from the Rensalaer who laid the first claim to New York land up near Albany, a place he called Rensselaerwyck, and a region that came to be known as Beaverwyck due to ongoing trade with native Americans. The Van Cortlandts and DePeysters important to this region are also mentioned. But such claims are not enough to make my point that the purchase of the remaining parts of New York by Watkins makes New York a colony and state mostly of Dutch-Scottish descent and the inhability of most of its land a direct results of the Scottish interpretation of land use and survival, an outcome that with time distanced itself greatly from the Anglican interpretations of the New World that forever tried to lay claim to land based upon Anglican philosophy and English-bred lines and interpretations. The English were more successful laying claism to lands north of New York, as far north as New Brunswick, as well as the first of their so proclaimed “virgin territory” Virginia to the south, but the first claimed lands of New York, were still New Netherlands in spite of its name change, and its philosophy and heritage the lowest bearer of this philosopher for a colony purported to be British in history and nature. In a note published about John W. Watkins at one of the family heritage sites on the web, the ancestry of John W. Watkins and the Livingstons is reviewed further by a descendent of this family, as follows. Another genealogists’s perspective of this family’s heritage is noted briefly in the following. To Hudson Valley historians, some more very recognizable names appear in these two notes. The first observation is the important relationship that developed between Livingstons and John Jay. The second note to ponder is the relationship the Watkins family almost had with the Loyalists and British supporters back home in Scotland and England. The New York Livingstons of course took the patriotic side and as a result of their shared scottish heritage, the Watkins did the same. Back home in Great Britain this probably led to unrest in the relationships this family had with governing families and politicians (the Whigs in England and their similar the Whigs in Harlem, NY). The matron of the Watkins managed to see her family through all of these troubles as she remained in New York while John W. was back in Great Britain trying to smoothen out business relationships immediately following passage of the Stamp Tax Act but just prior to the War. Judith and family were felt the need to remove to New Jersey during this time, as her husband John W. Watkins worked to maintain a hold of some new investments he just made in Great Britain. In the end, all of the attention Watkins paid to his purchases in Great Britain were transferred to his plans to take a hold of the new lands to be settled in western New York. According to the Stillwall note above, Watkins fought in the war and served under the Continental General Robert Erskine. Watkins developed his engineering and cartography skills during this time. When Erskine passed due to a fever, Watkins took over this position. 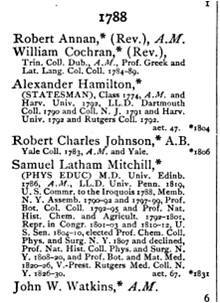 Catalogue of Columbia College in the city of New York: embracing the names of its Trustees, Officers, and Graduates Together with a List of all Academic Honours, conferred by the institution, from AD 1758 to AD 1836, Inclusive. see also Catalogue of Columbia College in the city of New York: embracing the names of its Trustees, Officers, and Graduates Together with a List of all Academic Honours, conferred by the institution, from AD 1758 to AD 1826, Inclusive. Watkins’ first major responsibility following his graduation was as an attorney working in New York City. 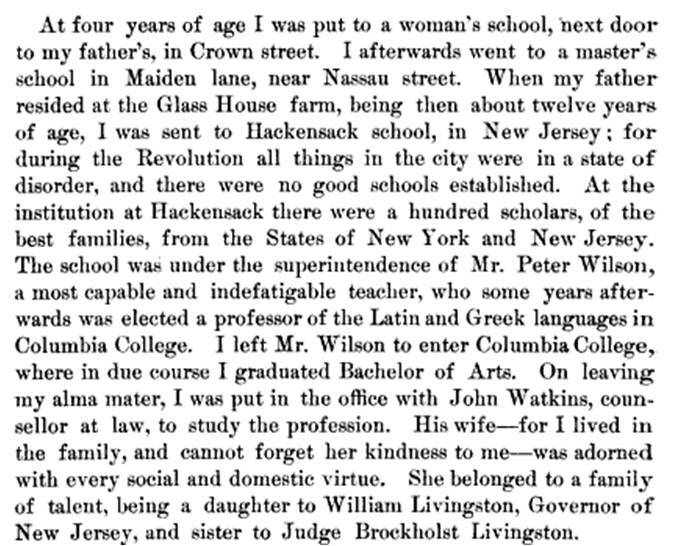 In a autobiographical essay produced by George Rapalje, George makes mention of his first job following his graduation from the same college as Watkins in 1792. John W. Watkins’s most important lifelong political connections were with Samuel Mitchell and the Livingstons, with Robert Livingston of the Hudson Valley serving as his most important mentor and professional associate. John H. Watkins’ enterprises as an attorney and member of the few socially elite families of local society enabled him to take some of the same moves as Robert Livingston and others in the family in the rapidly changing western New York. 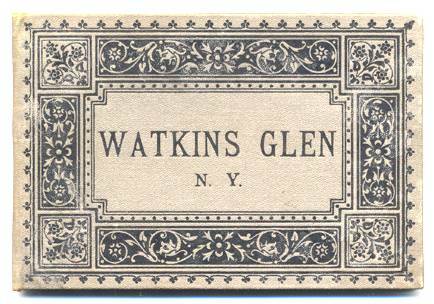 As part of yet another genealogical review, the time of the Lawrence Family, the following notes are made on that part of this family closest to John Watkins business venture, shedding a little more light on the history of Watkins Glen. The Lawrence Family at Cayuta Lake By Jeanne Bleiler. The Crooked Lake Review, January 1996. Accessed at http://www.crookedlakereview.com/articles/67_100/94jan1996/94bleiler.html. 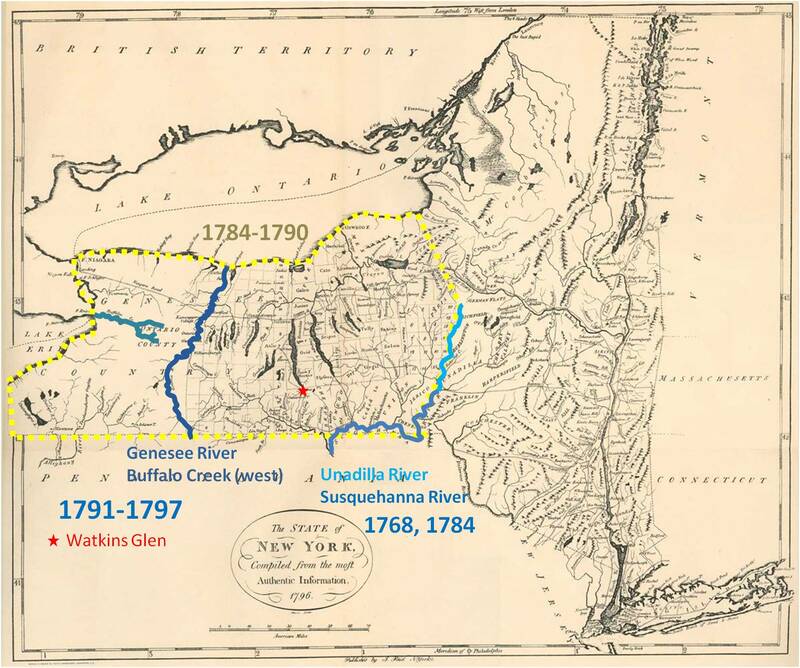 Prior to the American Revolution the vast western wilderness of New York was virtually untapped with the exception of a few scattered settlers and, of course, the Indians that settled in the beautiful wildlands. After the Revolution, New Yorkers and Europeans became interested in what lay to the west with an eye on capital gain. The Indians might well have been a problem, but Anglo-Saxon whites were far too clever and soon they obtained the area they desired. 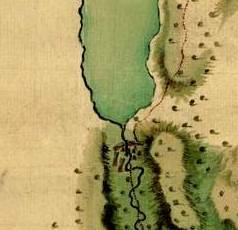 After the Revolution, the Iroquois still held title to “new” New York, the territory west of the Property Line of 1768 running from Fort Stanwix to the head of the Unadilla River. But six thousand Indians could not hold back tens of thousands of land-hungry whites. The federal and state governments made peace treaties with the Iroquois, who had been weakened by the war. In the second Treaty of Fort Stanwix, in 1784, the Iroquois surrendered to the United States all their traditional claims to land west of Buffalo Creek. From the time of Dutch settlement in New York, the system for dispersing land was to sell the land in large tracts that could be then resold in smaller tracts by the buyer, or let to tenants for rent. The system of selling large tracts of land to wealthy speculators continued as New York began to distribute its unsettled wilderness. The tract of land that included the Cayuta Lake area and much of Schuyler County interested some capitalists of New York City. Their names were Royal Flint, Jonathan Lawrence, Robert C. Livingston, John Lamb, Methanthelom Smith, James Watson and John H. Watkins. 1- page 151 Ellis, Frost, Syret, Carman, A History of New York State. Ithaca, N.Y., Cornell University Press, 1967. 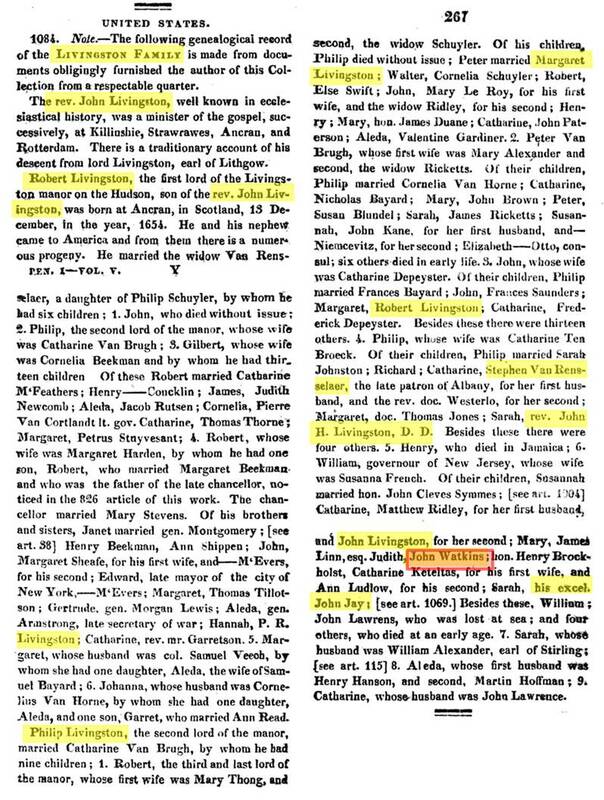 2 – page 26; 3 – page 595 Everts & Ensign, History of Four Counties, Philadelphia, J. B. Lippincott, 1879. Note: This paper was written in 1973 for an Elmira College class in New York State history taught by Dr. Herbert A. Wisbey, Jr. The chapel is still owned by the Chemung County Historical Society (although it is located in Schuyler County). It is rented for weddings and other occasions. Due to this unique in-law history, Watkin’s relatives now included descendants of owners of some of the most important parcels of land in New York and Hudson Valley history. Stephen Van Rensaelaer’s family descended from the first owners of Rensalaerwyck, Beaverwyck and Albania (Albany). The Watkins now were also related to the Schuyler family, whose possessions included a large portion of the upper Dutchess County land claims. There were also the Beekmans now a part of Watkin’s family tree. This family owned the central eastern part of the same county of Dutchess. At the north edge of the very young Dutchess County was Columbia County, a large tract of land that extended from the Hudson River eastward to the western borders of Connecticut and Massachusetts. Further to the North, the Livingston laid claim to all of Columbia County, and in a generation or two also held patents for lands west of the Hudson River and south of Columbia into Northern Dutchess County. By 1795, Robert Livingston owned or once held ownership for eveything extending from the Hudson River eastward towards the Connecticut border. Originally referred to as Livingston’s Patent, Livingston named his estate Clermont. This land at first was divided into two large regions, soon followed by numerous smaller townships like Livingston and Ancram. Throughout this period of claims, this land was a primary source for many of the natural resources needed by the larger towns and cities south of this part of New York. During the colonial era, the Livingstons initiated the lumber and resin industries so critical to the industry devoted to shipbuilding. Following the war, the Livingstons did much to market each and every research possible between 1787 and 1820. Not a part of the local topography and related ecosystems were untouched by the Livingstons, as they turned mixed conifer-decisuous forests into large agricultural fields, natural grasslands and prairies into sheep raising territory, various forms of wildlife into important domesticated resources of use to the leather and food industries, and the various waterways into numerous milling sites serving the needs of crop growers and lumber companies. A little piece of this family heritage was handed over to John W. Watkins during the mid-1790s with the goal of accomplishing the same in order to further secure the land claims being develop for the remaining unsettled portions of western New York. Chancellor Livingston even made an attempt to domesticate the local deer population, bringing in elk and moose as well hoping to develop an industry devoted to marketing their meats and other natural products. The swamps gave the Chancellor reeds and rushes, which he used to try to establish a paper industry. This region also became a haven for apple and other pome growers, as well as numerous starchy rootcrops, basic vegetable crops and the unusual, like rhubarb. No doubt John Watkins would later see the same potential for his naturally developed prairie land located out west by the Finger Lakes, once he and the Chancellor became well acquainted. Due to his upbringing and education at Columbia College in the city of New York, John W. was associated with His Excellency John Jay. The two of them in turn were business associates with the famous Chancellor Robert Livingston, a distant in-law relative of John W., as a shared close friend. It was this link between Watkins and Chancellor Livingston that ultimately resulted in Watson’s removal from Kingston, NY in the Hudson Valley, to some recently acquired land in western New York. Soonafter, John W. and several of his business partners including some immediate family members became the first privately funded investment firm to invest in the western lands of New York State. Most of the lands occupied prior to their purchase were claimed by small colonies of the newly formed and very young United States, along with several very large tracts of land resided upon and laid claim to by New York State militia and members of the state government. The immediate future of the state of New York after the Revolution required some unique political tactics be taken to secure new investors for lands previously considered wilderness territory. During the war, these regions were of great value to the British enemy, the remaining French families, the Iroquois and other Native American groups, and the American patriots and loyalists occupying this region. To prevent a resurgence of our former enemies, it was necessary for the government of the United States to lay claim to those land not clearly defined by the previous treaties. Due to the War, the state of New York was experiencing a financial crisis due to debts accrued during the war. It was up to the George Washington and then John Adams to eliminate this problem once and for all. Investors first tried to establish large scale marketing activities targeting the European countries. But some countries like Great Britain fired back by initiating a series of laws designed to reduce the importation of goods grown and produced by the former colonies and other distant parts of the world. This decision ultimately led to economic arguments between western European Countries and the newly formed United States. These arguments in turn led to isolation of the two hemispheres from each other, the goal being to make European trade more self-sustaining. It was also the potential limitations of our natural resources that led to the initiation of our westward expansion. In order to sustain needs of United States and its newest additions, new lands had to be claimed, new resources found, new businesses generated. The lack of claims to the great northwest by the United States, accompanied by the French claim to the bulk of the central part of this contenent, accompanied by Spanish Mexican claims of the south, and Russia to Denmark claims concerning the true Northwest, provided the opportunities needed by any of these countries to lay claim and ownership of those parts of North American not already claimed by United States due to the War. Evidence for this appears in some of the earliest maps of what is now State of New York State. In its western half are found “colonies” formed by the State of Massachusetts just west of the Catskill Mountains and close to the Allegheny Plateau. Thomas Jefferson could see this problem developing during the years immediately prior to his Presidency, a position he held from March 4, 1801 to March 3, 1809. Jefferson and others in national government sensed the need for a more efficient way of marketing this idea that the United States needed to own the more western parts of North American continent. For this reason, companies were formed with the roles of initiating these activities and those people most responsible for laying out these plans for expansion were the descendent of the first land owners of this country to remain patriotic throughout the War. In New York, the Livingston family was one such family of investors. By the time this westward expansion growth of the United States began, during the years just prior to the Lewis and Clark Expedition, the first expansions into western New York involved mostly military-based groups and activities. Chancellor Robert Livingston oversaw most of these events, setting the stage for his most important role just a few years later regarding the Louisiana Purchase. Once the military tracts were established defining western New York, plans were initiated to lay claim to the remaining part of what would later be New York State. Chancellor Livingston had one of his family members John W. Watkins and some associates of John W. become one of the first private investors to take advantage of this new opportunity. To market their newly purchased lands to future investors and settlers, a partnership known as Watkins and Flint was formed whose member began investing in and marketing their new properties. With their lands taken possession of by state and federal offices, the choice of removing further west to unclaimed Northwest Territory brought a new series of political concerns and social issues to light. The United States was officially a country but not at all the owner of most of the land upon which it resided. Most of this part of North America was open, unclaimed territory, with legal claims to certain portions of this large area claims by England, France and Spain. The largest portion of these land claims were made by the French, who claimed possession of the entire great plains region heading westward towards the Rocky Mountains. Along the southern border of the original thirteen colonies was the boundary of what was formerly New Spain, now claimed as its won country known as Mexico. Mexico laid claim to much of the southwest corner of the continent well north of its northern edge defined as being within or fairly close to what is now the state of Florida. The Far Northwestern corner of this continent was almost entirely claimed by Great Britain, and was quickly being developed into a new territory and source for its highly valued natural resources, especially animal fur. Other countries capable of laying claim to that part of North American not considered part of the original colonies that formed the United States were the Russian territories occupied along the western shoreline, especially up near what is now called Alaska. Another set of isolated shoreline communities to the north and south were also related to these Russian claims, with some evidence suggesting that even the poorly represented Danish explorers and merchants were trying to lay claim to those parts of North America not at all considered to be in the domain of the United States. Throughout all of these political discussion made for defining territories and commerce, there were the indigenous claims that were repeatedly reassessed and redefined by the various colonial and United States government official involved. The Livingston family has the unique history of being closely tied to the establishment of the first of these claims for the New York region during the 17th and early 18th centuries, and now, as a part of the first periods of growth in United States history, Chancellor Livingston and his associated would play key roles in defining the total size of the United States as a country in possession of its own geographically defined physical land domain. Chancellor Livingston along with Thomas Jefferson were the primary reason the United States came to possess both the Eastern and Western shores of its continent. More exact descriptions and claims for its northern borders and southern borders would become more important parts for decades to come. For now, the ownership and settlement of all lands from the eastern half of New York westward to Ohio, and then westward through Northwest Great Lakes Territory, and then still further westward to the Rocky Mountains and finally to the Pacific Ocean, were the goals of Livingston and his sequiters. John W. Watkins’s claims to western New York was one of several claims made to the remaining portions of this state needed for the United States to be able to secure its later claims made to the Great Plains, beginning with the Louisiana Purchase. John W. Watkins was one of the first products of this new look at United States boundaries and barely occupied or settled northwest and western territories. A number of earlier maps of the North American continent demonstrate the emphasis that had been placed on the Atlantic Coastline and latitude features of claimed colonial (later state) territories. As a result, the boundaries of Connecticut stopped at the eastern edge of New York near what is now the Connecticut border, but managed to recommence once one traveled past the region where the current western boundary of thus state. Along the Great Lakes region, the north and south boundary lines followed this same latitude line, continuing as far westward as the lands claimed by US government within this territory. We note this same much smaller scale of establishing distant land claims practice by Massachusetts, a state which laid claim to that part of what is now New York located at the bend in New York’s western edge just north of New Jersey, and from there extending directly westward towards the southern edge of Lake Erie. Settlements or Colonies. 1806 medical geography queries were developed by David Hosack and submitted to most of the regions under United States military control and leadership. Around 1792, Chancellor Livingston made it possible for entrepreneurial groups like that of Watkins to lay claim to lands in western New York. That land which was next to what is now the northern latitude edge of Pennsylvania was most at risk of being lost to neighboring landowners. For the purposes of New York, the State of New York and in particular Chancellor Livingston began to implement a series of exploration, land claim, and land use planning strategies. 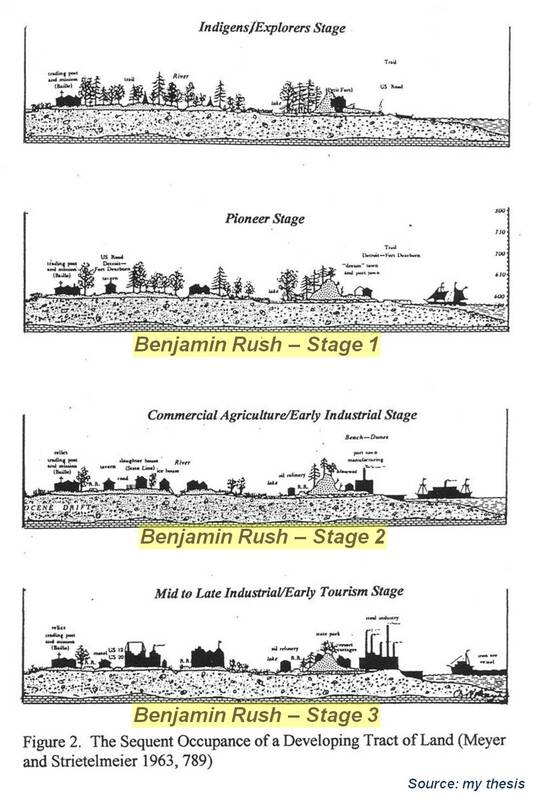 One of these was the use of military rights to lay claims, for which the New York Militia was engaged in the exploration and claim of these regions. There were also several small companies of investors that Livingston used to initiate his claim to territories west of the settled regions. One of these businesses was headed by an associated and twice removed family member related to the Chancellor, Lawyer John W. Watkins, Esq. John W. Watkins was a follower of the Ancram, Scotland born philosophy promoted and proselytized by the Livingstons he married into. This philosophy stated that the health of the people was very much related to the place where ancestors and relatives were common raised. This unique interpretation of existence and survival that Livingston and Watkins had developed was a product of the early evolutionist and taxonomist Erasmus Darwin, the grandfather of Charles Darwin, a scientist renowned for his work on evolution and natural selection. Erasmus Darwin’s work was published during the period of time when Lamarckianism defined the belief system for many evolutionists. The concept that generations were capable of adapting or changing over several generations to meet whatever change in the natural environment were taking place was a common belief in the late 1790s and very early 1800s. Watkins, like his mentor Chancellor Livingston, believed in this philosophy and followed up on whatever implications such truths might result in regarding land use and the need for new and different regions to settle. For an entrepreneur in search of new lands to lay claim to, this meant that places located within the naturally health temperate zone had to be further explored for new settlement places to be found and settled. One had to explore those regions between the appropriate latitudes, which for New York was land between the settled lands along the Atlantic coastline, and the newly settled location about to be established close to the Great Lakes. depended not only on people’s health, but also the health of the land itself–its soil, geology and water features, as well as its climate and weather, and its natural productivity–the value and diversity of its fauna and flora. When John W. Watkins received his college degree at Columbia in New York City in 1788, United States medicine was pretty much an undefined philosophy and its means for development and practice of care undefined. There were practitioners who resided in the New York region as remnant of the old pre-Revolutionary War traditions. But there were also many physicians who viewed health as a consequence of the natural environment and man’s lifestyles and roles as a missionary serving in the pastoral sense. When Watkins formed the town with its ever important health-defining name, Salubria, he used this philosophy to market its inhabitability. Medicine was rapidly changing its philosophy, and American doctors and professors in science and medicine were defining their view of medicine in a way substantially different from the European ways of philosophizing this field. Watkins effectively took advantage of this part of the early United States mindset during the 1790s, by establishing Salubria, today known as Watkins Glen.